Construction business and come along winches go hand in hand. They are widely used in various businesses such as tree care, construction, automobile business etc. 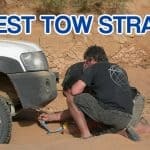 The job of a come along winch is to pull, stretch or lift heavy objects. Not only does it makes the job easy for a worker but also saves time and effort. However, that’s just one side of the picture. Despite being of great use, using a come along winch can become a nightmare if used in the wrong way or when one with poor quality is used. A lot can go wrong when it comes to using come along winches such as finger amputation, bodily injuries and even death. Mostly, these mishaps accompany when come along winches, also known as power pullers, of poor quality are used. A poor quality winch may put the worker’s life in jeopardy because they are not safe to use. There are a plethora of them on the market claiming to be the best at what they do but that’s not true. While some are good and safe to use, a lot of products are of poor quality. Finding a power puller that packs a punch when it comes to being a juggernaut at lifting, pulling or stretching heavy load might be a daunting task but it’s not impossible. Which Is The Best Come Along Winch? No one can tell it better than the end users if a winch is worth it or not, which is why we conducted a survey to determine which is the best come along winch out there. The cables and ropes of these power pullers are sturdy. The drum which winds the cable/rope with a pull of a lever is made up of good quality. The anchor hooks that are attached to a heavy stationary object such as truck or tree are solid and galvanized (corrosion free). The load hook which is tied to the object you want to move is strong. Best For Medium Sized Jobs – 2000 Pounds of load. Can be used in construction, farming and landscaping sites. This is the best come along winch for us because it brings the cup home. It is designed to move/pull heavy loads single-handedly with great ease. Its gears are powerful and it can easily pull as much as 2000 pounds of load. There’s a 17-inch ratchet handle to make a firm grip around it which gives enough room to the hands in operating the handle. One Hand Operation: What sets this power puller apart from many others is the fact that it doesn’t require two hands to work. The design and pulling power are set with thorough consideration to provide ease of use. 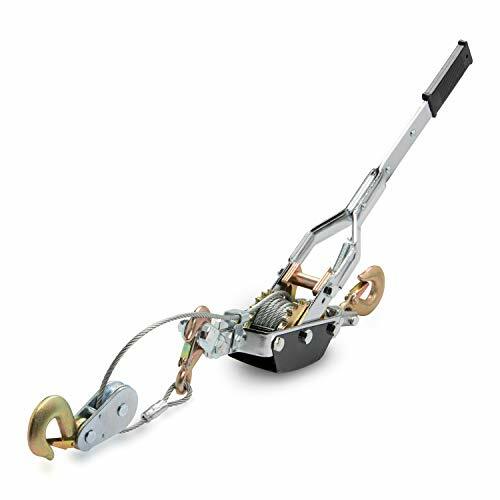 Pull And Lift: This power puller can straighten a number of bent objects such as trees, mailboxes and fences. Other than that, it can pull out things that are stuck such as a tractor in a garden full of mud. Now there comes the interesting part. Since this beauty can only handle up to 2000 pounds, it comes marked as ‘not safe to lift heavier objects’, however many users have been able to do so without any issues. Still, it is recommended that you do not try lifting heavy objects with this one and use it for the purpose it is built for. Works For Gardening Purposes: Imagine a bent tree that needs to be straightened and staked properly. It seems like a dangerous and a difficult process, but with The Tekton 5541, you can make it happen. Works for pulling and lifting heavy logs of wood as well. Corrosion Resistant: It’s common for a come along winch to sustain rust, especially when it is being used in the rain. The rust affects the overall quality and makes the gear squeak and get jammed. This restricts the product from working at full capacity. The Tekton come along winch, however, is composed of hard steel material which is corrosion resistant. Thus, its efficiency isn’t lost with time or under poor weather conditions. Best For Medium Sized Loads (2000 pounds): This winch comes with an amazing pulling power thanks to the well-built ratchet gear pulling system which makes it easy to operate it single handedly. Durable Steel Cable: The 7 feet 10 inches cable is made up of a high grade aircraft material which is strong enough with a diameter of 3/16 to withstand tension when pulling heavy loads upto 2000 pounds easily. It’s max rated capacity is 4000. Ideal Weight: It can become daunting if the weight puller itself is heavy. If a power puller weighs a lot, it becomes difficult to operate and also poses a risk to the user. The Tekton 5541 weighs 8 pounds only making it easy to operate. Safety Features: The main concern of workers who use a come along winch is their safety. It’s quite easy to sustain an injury while operating a come along winch because of a slipper handle or no option to close the latch. Luckily, the Tekton meets both these criteria. It has a 17 inch ratchet handle which is contains a top grip part that doesn’t slip. Other than that, the safety latch hooks (⅜ inch) close automatically to keep it secure the user. The chance of the cable snapping is almost zero and no customer has complained about the cable so far. Other than that, letting go of the built up tension in the cable is hassle free, all one needs to do is release the pawl and it releases the tension one notch at a time. This provides safety as users won’t have to exert a lot of pressure on the handle to let go off the tension and hurt their hands. Ideal hook size – ⅜ inches. Maximum cable length is short – 7 feet 10 inches. This is one of the best power pullers you will come across as it is cheaper and beats many power pullers in the same price range. If your load pulling need isn’t satisfied with a 2 ton Tekton then there’s another one in store for you. The TEKTON 5547 4-Ton Dual Gear Power Puller. This one packs even heavier specs and is designed to carry out heavy jobs. Best For tough Jobs – 2000 Pounds of safe load and 4000 max rated capacity. It’s a double line winch, therefore, the max rated capacity on double line is 8000 pounds. It can be used in construction, farming and landscaping sites. It’s almost same as Tekton 5541 but with a few upgrades. Since, it’s a double line winch, It can pull more weight. The handle is longer and offers more room for the hands to form a grip. The best part? Increased length of the cable. Meant For Heavy Jobs: It can smoothly pull a car on to a trailer, tighten a zip line cable, and straighten both small and big trees. Safest To Use: This one has upgraded safety options. The handle is increased to 21 inches. The safety latch hook is 5/16 inch. Increased Cable Length: This one can stretch out more with its total cable length of 12 feet 7 inch. Also, the cable has a diameter of ¼. Other features are same as The Tekton 5541. Cable length – 21 feet 7 inches. Max capacity – 8000 pounds. This power puller has a top notch and durable rope for pulling almost anything. It can recover vehicles, load material in trucks, lift and move logs, pull trees & stumps, move boats and trailers, move/lift furniture and clears debris from a site. It’s a bit different than the previous product since it has a rope that pulls and lifts objects. The rope is wear and tear free because it is made up of Dacron polyester. It can lift up to 1500 pounds of load. Since it’s a rope pulling winch, unlimited rope length can be used with the help of the ratchets. Unlimited Length Rope: The quality that sets this come along winch apart is it being a rope puller. In a cable pulling winch, the drum winds a fixed length of cable on to it but in a rope puller, such as in this product, you can use unlimited length of rope as there’s no winding drum in this case. The rope is pulled with the help of ratchets. Durable Rope: It comes with a 100′ of 1/2″, 3-Strand Poly-Dacron Rope. This rope is wear and tear free, meaning, one won’t see any cuts or shreds coming out of it even after extensive use. Flexibility: The fact that this winch uses a rope and not a cable, the flexibility is much more improved. This makes it easy to do both lifting and pulling. However, safety precautions are necessary when doing the lifting part. Safety Features: Safety is the most important concern in this line of business. It’s not easy to pull and lift heavy loads. Keeping that in mind, the Maasdam Pow’R Pull A-100 is your best bet as it is made keeping safety in mind. Firm Grip: The handle is made up of a non slippery material which ensures that the grip is strong even in unfavorable weather conditions. Another benefit of having a flexible and comfortable handle is that the user won’t have to deal with fatigue and pain if used excessively. OSHA Safety Latches: The safety latches on this product are OSHA recommended. So, you can rest assured that they provide complete safety. No fixed length cable restriction. Less risk of getting hands injured with a comfortable handle. Does both pulling and lifting. Stress free with no notch tension. The rope is breakable above 1500 pounds of capacity. This come along winch is the next big thing because of its versatility, durability and ability to rock any heavy job like a piece of cake. 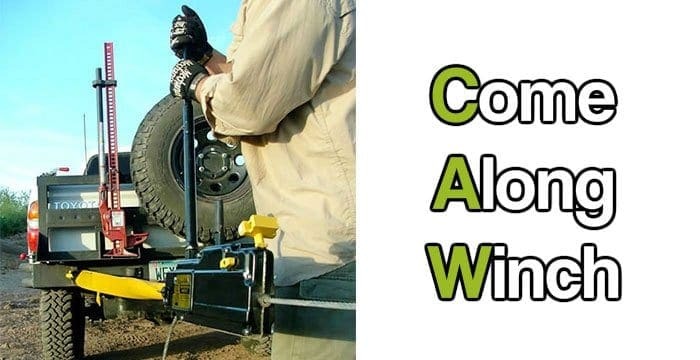 It can be used in automotive, landscaping, equipment handling, farm and ranch,, boating, hunting, camping, construction, fencing, gardening and vehicle recovery/rescue. There aren’t many come along winches out there that are able to pull so much off. People who are looking for winches that can really take a load should turn to this product. It has a 2 ton capacity of power pulling stuff with ease. It’s safe, effective and easy to use. What sets it apart from the previous Maasdam Pow’R Pull is it being a 2 ton capacity power puller with a 6’ maximum lifting capacity. There’s an aluminium ratchet wheel for sturdiness and solidity. 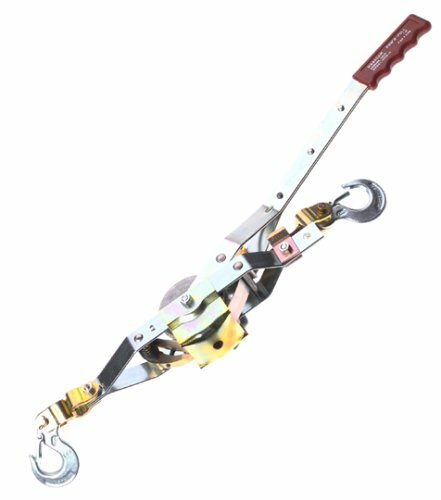 It isn’t a rope puller but a cable puller with a 3/16 inch durable and aircraft grade cable which is also corrosion proof. The pawls are made up of steel alloy with safety spacer sleeve. 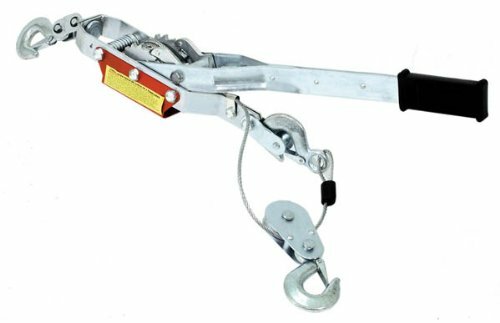 Ratchet Guard: Unlike Maasdam A-100, this one has a ratchet guard to provide safety for the worker operating the winch. Additional Safety: The steel alloy pawls interlock with the ratchet wheel in a stronger way. This is due to the space sleeves on the steel alloys that provide consistent alignment between the ratchet wheel and the pawl. The rest of the features are same as the Maasdam A-100. Strong cable with a 3/16 inch diameter. The hooks aren’t very durable. It is used to do tasks related to automotive, landscaping, equipment handling, farm and ranch, boating, hunting, camping, construction, fencing, gardening and vehicle recovery/rescue. There are some minor differences between the 144s-6 Maasdam Pow’R and the previous two models. It has the same aluminum alloy ratchet and a steel body along with galvanized frame and cable that keeps rusting at bay. It has the same interlocking feature and space sleeves to provide a precision fit. The features that set this product apart from the A-100 Maasdam and 144SB-6 is its maximum lift and leverage. It has a maximum lift of 12’ and a leverage of 15:1. Safety Features: The safety elements are almost the same as the previous product. It is widely used in construction, farming, automotive, tree care and all the tasks that involve heavy load moving. If you’re looking for a come along winch that can do some serious pulling then your search ends on the Neiko 02256A Power Cable Puller. Unlike other products on our list, this one has the maximum amount of load capacity handling capability. The body is zinc plated to avoid rusting. It also offers twin geared ratcheting system to distribute load power evenly. Heavy Duty: This product is meant to carry out tough jobs that require a lot of serious pulling power. It can bear weight up to 5 tons easily. This can be used to cut and drop trees, however, it’s not recommended if you have no experience about how to do it. Durable: The entire body is manufactured with high-end steel and the hooks and gears are zinc plated to prevent rusting. Powerful Ratcheting System: A ratchet system can’t be powerful if it makes it difficult to pull or move heavy loads single handedly. As far as this come along winch is concerned, its design and power work together to offer smooth usability and single hand operation. Twin Gear Locks: An amazing feature of the Neiko Power Puller is its double geared design locks that balance the load equally to prevent too much stress. The force is evenly distributed along both the gears to pull off heavy loads with great ease. The handle of a ratchet is one of the most important parts of a power puller. The handle on this come along winch has a PVC coated grip to avoid slipperiness. Other than that, there are 3 latching hooks for additional safety. Offers brute pulling force – 5 ton capacity. A bit on the heavier side with 13.3 pounds. The handle isn’t much durable. This 4 ton come along winch is capable of pulling up to 8000 pounds of load at maximum which is quite impressive. The product is mostly used by workers in constructions work, farm and ranch, home projects automotive and workshops. Durable Body: The reason that it is a bit on the heavier side is due to the high end steel it is made up of that also makes it quite durable. The product is meant to last longer, however, the drawback is that it weighs 16 pounds and may cause a bit difficulty in operating it. Heavy Duty: All those people who come across heavy lifting moving jobs every day in their line of work can turn to this come along winch. It can bear up to 4 ton of weight which is quite impressive for the amount of money it is being sold at. Twin Gears: Since the power puller is meant for pulling heavier weight, it has dual gears to distribute the force equally and minimize the stress that the winch goes through. This also promotes safety as the user doesn’t have to put a lot of effort on the handle to let go of the tension in the cable. Durable Cable: Heavier pulling requires a strong cable and the Torin Big Red Come along fulfills this requirement. The cable is a durable one and doesn’t break off easily when extreme stress and force is applied. Safety Features: The ratchet system works in a safe manner and the handle offers a firm grip to the user to reduce fatigue. Double wheel and double claw. Pulls and lifts 4 ton capacity of weight. Cable length is only about 5 feet long making it way too short. We hope that this power pullers review must have cleared the confusion that you had regarding buying one. If you’re looking for an all rounder that has all the qualities of a good power puller then we recommend Tekton 5547 or Tekton 5541. 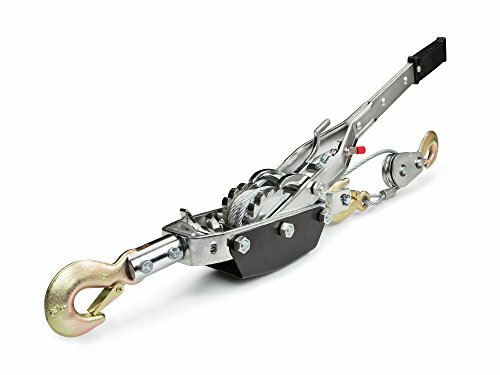 In case, you’re looking for a power puller that offers unlimited length rope then Maasdam Pow’R Pull A-100 3/4 Ton is your best bet . For heavy duty jobs, go for Neiko as it can bear 5 tons of weight easily. Can I use TEKTON 5547 4-Ton to tighten a zip line cable?